The portion of the hair that is visible and touchable is called the “shaft”. Each hair shaft projects from the follicle, which is a cylinder-shaped pouch just below the surface of the scalp. The hair is attached by the hair root — where the hair actually grows and is nourished by blood capillaries — then attached to the base of the follicle. Hairs are made up of cells, like the rest of the body. As new cells form at the root, the hair shaft is gradually pushed further out of the follicle to the surface. The cells at the base of each hair are alive and close to the blood capillaries. 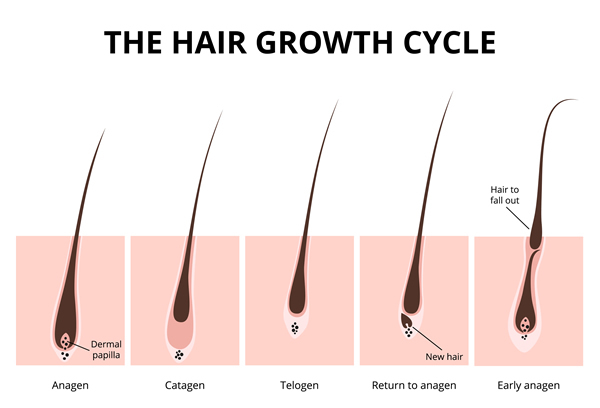 As hairs get pushed further away from the base of the follicle they are no longer being nourished and consequently die. In death, they are transformed into “keratin” – a hard protein. This means that each hair we see above the scalp is actually dead protein. It is the follicle positioned deep in the skin that is essential in the process of hair growth. Also, the size of the follicle from which it is growing helps determine the thickness of each hair. The first phase is the growth stage. Hair grows at about 0.4 inch each month. This phase can last between 2 and 5 years. At the beginning of the Catagen phase, the bulb detaches from the blood supply and the hair shaft is pushed up. Next is the resting stage. During this time, there is no growth and this phase lasts about 5 months. At the end of the resting phase, the hair is shed and the follicle starts to grow a new one. At any time, approximately 90% of the hair follicles on the scalp are growing hairs in Phase 1 and only about 10% are in the resting phase. If a follicle is destroyed for any reason, no new hair will be able to grow from it. If there is a disruption in any of the stages of hair growth, the person may become bald. For instance, if the follicles fail by staying in the resting phase and then shed hair instead of growing new hairs, there will be less hair on the head. Another situation may be some interference with the formation of new hair cells at the root during the growing phase. If follicles have been destroyed by for example by a burn or trauma to the skin, there will be hair loss in that area. An person can also appear bald if the hairs are growing but are so fine and fragile that they break just as they emerge from the follicle.